Nature is comprised of five elements that are Earth, Water, Fire, Air and Space. The same elements are there in our human body. 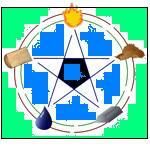 By balancing the five elements in the body, perfect health can be achieved. The key to success for any practice is discipline, regularity and aspiration. Results are inevitable if one is sincere in sadhana (practice). Here I want to introduce a simple meditation and request the readers to practice regularly for attaining good health, peace of mind. Calm mind can do miracles compared to restless mind. There is one old saying that “All roads leads to Rome”. Similarly in spirituality, “All practices leads to liberation”. Sit in a meditative posture. Spine straight and body relaxed. Observe your breath till you feel calmness of mind and thoughts subside. First pray mother earth’s energy to enter into your body. Feel the divine energy pour and let it stabilize and balance in your body’s each and every cell. Affirm mentally that “The energy element of earth in my body- balance, balance and balance “. Continue the exercise with Water, Fire, Air and Space with affirmations in sequence..
For water: “The energy element of water in my body – balance, balance and balance “. For Fire: “The energy element of fire in my body – balance, balance and balance “. For Air: “The energy element of air in my body – balance, balance and balance “. For Space: “The energy element of space in my body – balance, balance and balance “. Open the eyes. Gently rise from your meditation place and go back to your routine tasks.